If you are looking for opposed dampers, then you are in the right place. Also known as opposed blade dampers, they are a great way to optimize your heating and cooling system. No matter the application, PlumbersStock is certain to have the best damper for your installation. With a variety of discount options, you will find solutions from quality manufacturers, including the Shoemaker OBD series. An opposed blade damper is a type of zone damper for use within a pipe or duct and vent system designed with adjacent blades that open and close by rotating in opposite directions from each other. These kinds of dampers are commonly used as volume control devices in supply, return, and exhaust air systems. In other words, they work to regulate air flow through grilles and diffusers. This damper is mounted directly behind the supply, return, or exhaust air grille and it redirects airflow to the desired location in your home. Material construction is usually aluminum or steel. There are various different blade dampers options available on the market, from fire dampers to outside air louvers. To find the right damper for your application, narrow your results by using the filters on the left. If you need additional help, please call our expert customer service team to take care of all your questions. Fire Damper – These dampers are known as passive fire protection products and are used in your HVAC system to prevent the spread of fire inside your ductwork through fire-resistant walls and floors. When a rise in temperature occurs inside your ductwork, the fire damper closes, forcing springs to close the damper blades. This prevents the system from “fanning the flames” if a fire were to occur. Other times, the fire damper may close following delivery of an electrical signal from a fire alarm system utilizing detectors remote from the damper, indicating the sensing of heat or smoke in the building space the duct system. 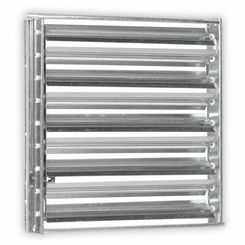 Outside Air Louver – An outside air louver is a part that is installed on the building’s exterior wall and is designed to inhibit the entrance of wind, sand, insects and other debris from entering the building. 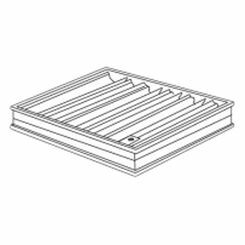 These parts have large angled slats at regular intervals that allow light and air in while inhibiting wind, rain, snow, sleet, sand, birds, inspects, and airborne debris. These weather-resistant components also enhancing the building’s outward appearance by coming in subtle aluminum or steel finishes. In addition to that, you may restrict the flow of heat with smoke dampers. If you’re looking for a damper to work alongside your application, there’s no better place to shop than PlumbersStock. We offer a large selection of high-quality opposed blade dampers at discounted prices you won’t find anywhere else on the market. Find the perfect damper for your home or building and take advantage of our low prices by shopping with the HVAC experts here at PlumbersStock.